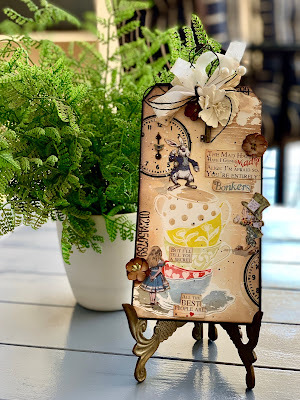 I am guest designing over at the Frilly and Funky blog and the challenge for this month is "March Madness" and we would love it if you would play along. Description: Don't be afraid, the challenge isn't going to require you to use basketball inspired images. Instead I want you to be inspired by Alice in Wonderland. 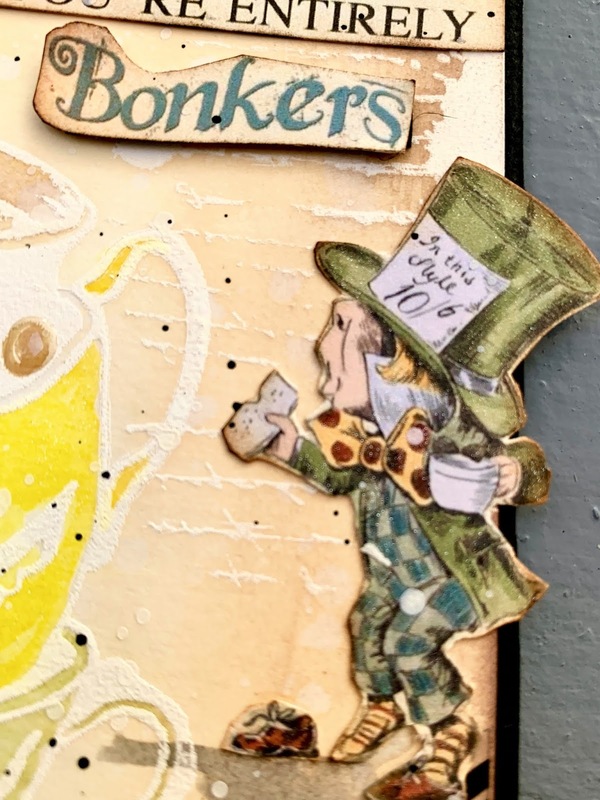 I started from this quote of a conversation between the Mad Hatter and Alice: The Mad Hatter asks Alice: "Have I gone Mad?" and Alice replies "I am afraid so. You're entirely bonkers. But I'll tell you a secret. All the best people are." The challenge is to take any idea or concept from this wonderful tale to inspire your project. There are so many wonderful bits or pieces to be inspired by like the Queen of Hearts, the mad hatter, the looking glass, tea party or Alice herself. The possibilities are endless. Anything can be your inspiration but make sure you reference what inspired your art from the story! I chose to go with a tag. 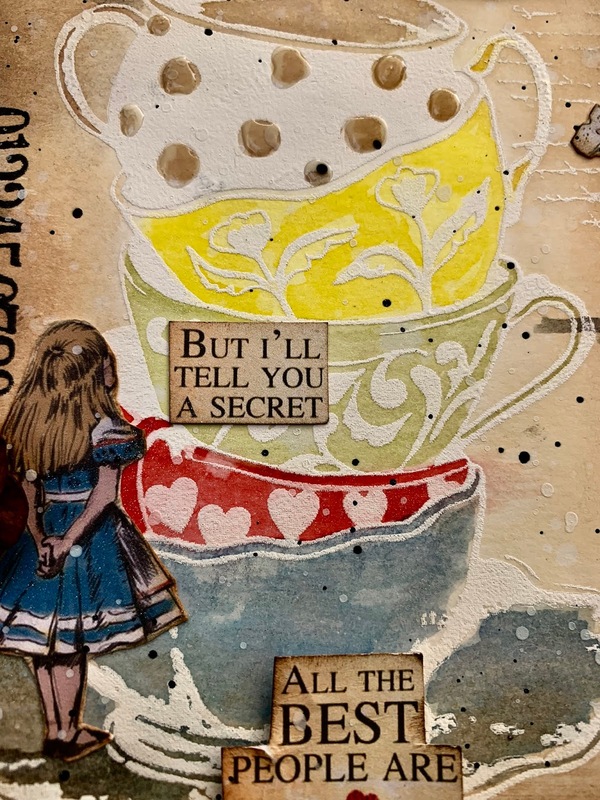 I used some lovely silkscreen stencils and white acrylic paint to do the teacups and also the script and splats. The background is blended oxides in tea dye and walnut stain. 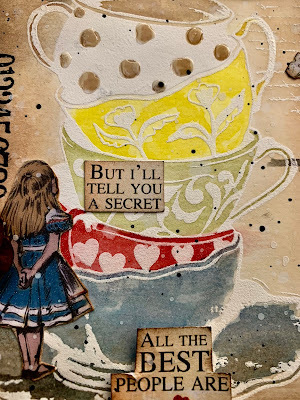 Next I painted the tea cups with distress inks. 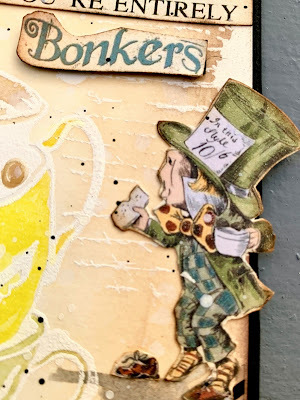 Mad Hatter - Have I gone mad? 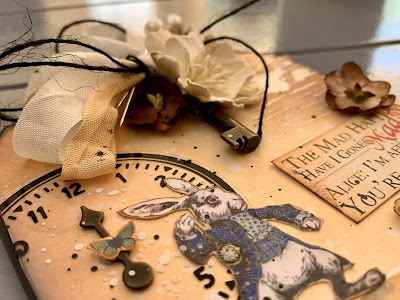 Alice - I'm afraid so you're entirely bonkers. But I will tell you a secret all the best people are. I added an acetate clock under the rabbit and down below the mad hatter. and did some splats with white and black acrylic paint and finished the tag off with some flowers, seam binding that was died with tea dye and added a little key. Thanks for stopping by and for taking the time to leave a comment I really appreciate it. Congrats on the GD..beautiful tag and love the theme. Magical!! Congratulations on the guest spot, your tag is stunning! I just love all the details, you my dear never disappoint! Wow this is amazing, I love all the characters you have on this tag.. love the close up views..
Congrats on the GD spot. Beautiful tag..love the whimsy! !